In manufacturing, it is becoming increasingly necessary to permanently mark products or components with identifiers for the purpose of traceability. This process is used to track a part or assembly throughout its life cycle by relating a Unique Identification (UID) to a database. Labeling products in this manner helps to reduce costs of a recall campaign and improve production processes. Manufacturers use pin marking machines, or systems, to aid them in the process. This method of marking uses pneumatic, electric or battery controlled carbide or diamond tipped stylus’. The tip marks a series of dots that form alphanumeric characters, bar codes, company logos, serial numbers, 2D DataMatrix Code, date and time stamps and just about any other identifying mark that you can imagine. From individual components to sub-assemblies to system assemblies to final assembly codes, a manufacturer can benefit greatly with the ability to find out the history, use or location of components. Pin Marking Systems are a great alternative to expensive laser/CNC marking, tedious hand engraving or chemical etching. These systems are rugged, self-contained and extremely easy to use. 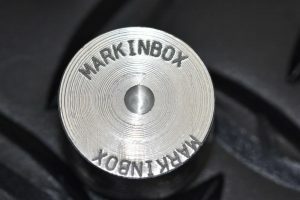 MarkinBOX is the leading pin marking system manufacturer with a worldwide presence. Contact MarkinBOX today for an evaluation of your process. They can assist you in picking out the pin marking machine that is best suited for your application.